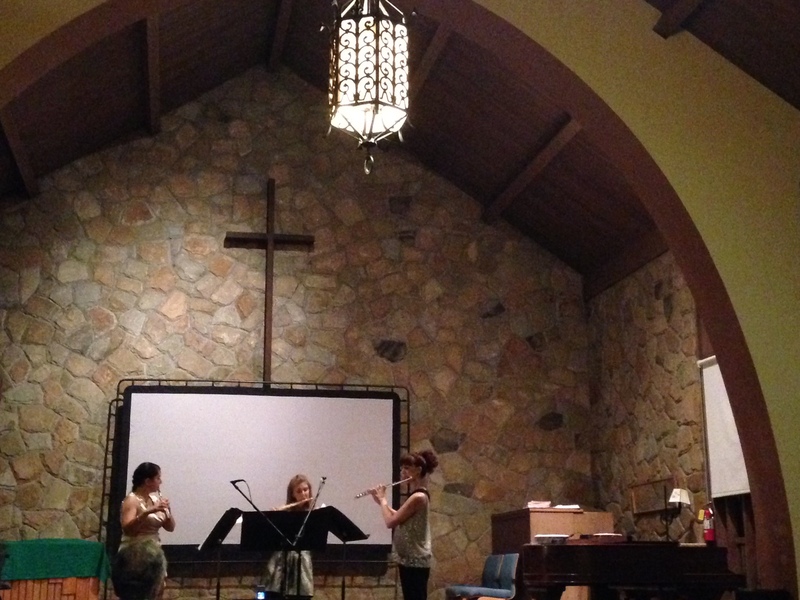 The Guerrilla Composers Guild concerts were awesome. If you missed them, you can check out a review of the first concert here, and listen to the recording of my string trio below and on my Sounds page. I will be spending the holidays in upstate New York, experiencing my first white Christmas since I was five. I continue to make my way through Jan Swafford’s monumental new Beethoven biography, which so far, has already been tremendously illuminating. I am also finally getting back to some fiction, having just taken a detour to engross myself in some thoughts on poetry, in preparation for the numerous projects coming up next year involving poetry. 2015 is already shaping up to be a fantastic year, but I shall save details on everything for later. For the moment, I shall bid adieu for the rest of the year as I head out to enjoy a welcome change of scenery. Spent Thanksgiving with the family in Orlando. It is always great to get some distance and perspective on things. Not to mention spending time with the folks. The year is winding down, but there is more going on than ever. The Mobius Trio return from their East Coast tour, playing my piece, Initial Darkness, among other works. The boys had a blast over there and I have heard nothing but awesome reviews. Hopefully a recording of some sort will be forthcoming in 2015, so keep an ear out for that. I just finished up two pieces for the Left Coast Ensemble’s Intersection 2015 workshop. Both short works written specifically for the participants. One is for clarinet, viola, and piano entitled Firefly Reflections. The other for flute, violin, and cello, entitled in the moonlight there were flowers. I have a tendency, whenever I am in need of a title or two, to just pick up the nearest book of haikus and use something from the first couple that catch my eye. So far this has worked remarkably well, as the titles it has produced have had a fitting resonance with the emotional quality of the works in question. Some electronic work of mine may surface sometime over the next couple of months. Keep an eye on this space and I will be sure to let you know when and where. As mentioned before, I am working on a new song set with the poetry of J.L. Nowak. Again, another artist very much worth your time to take a look at. I will be setting her work Frames, which will include a visual component. Lastly, a teaser of more work that will be coming up in later in 2015, check out the poetry of Roy Doughty. Have a wonderful holiday season and I hope to see you at some of the shows coming up. UPDATE: check out the interview I did with the Guerrilla Composers Guild about the upcoming show here! This week is very exciting. I will have two premieres on back to back nights in the Bay Area on October 11th and 12th. First up is my new piece for Areon Flutes entitled Spirals Slinkies Staircases. This was a commission as part of the group’s monumental tenth season and I am very honored to be taking a part in it. They will be playing the piece this Saturday, October 11 at Trinity Chamber Concerts. The following day the Mobius Trio will be premiering my new piece for them, on three electric guitars, Initial Darkness. That will be taking place on Sunday, October 12 at 5pm at the Center for New Music. I am very excited to be working with both of these groups and can’t wait for all of the music making this week. A friend of mine who shares the same teacher as me, was prompted by said teacher to ask his colleagues (and I assume more established composers as well) what their thoughts were on the appropriate language to use in scores and tempo indications. So here are some of mine. Obviously, the main concern here is communicating effectively and succinctly (and judging by the length of this post, something I could possibly use some work on). Probably the best way to achieve this is to communicate in a players’s native language. It is for this reason that my scores are in English. As of this writing, I have yet to write music for non-native English speakers, but hopefully that will change at some point in the future. If I become so lucky as to have a commission from a non-English speaker, I will probably produce a score in primarily whatever language it is they are fluent in. I will then most likely produce a second copy of the score in English, as most other musicians who might be interested will most likely be English speakers. But, it is unrealistic and ineffective to have everything in a score (directions, indications, etc.) in English. There are certain phrases, symbols, and abbreviations that have become part of standard performance practice. The issue then becomes drawing the line at what has and has not become universally adopted. William Bolcom once told a story about exactly this at a master class I watched in college. He recalled that when he was younger, he sought to have everything in his scores in English, because, he is an American composer. But it came to a point where he put “plucked” in a string part instead of “pizzicato”, and the player just simply asked him if he meant pizzicato. A discussion ensued chewing up much valuable rehearsal time. The abbreviation pizz. quickly and accurately conveys to the player what is intended. Pizzicato has become an English word, meaning to pluck the strings. It is even included in Merriam-Webster. Other symbols and abbreviations have become universally adopted, at least in the Classical music community. The symbols “ff” and “mp” similarly have a commonly accepted meaning (even if this meaning is discussed and argued about in context in rehearsals, but then again almost everything is). It would be misguided and a waste of time and energy to put such indications as “softly” or “very very loud” (or “very very strong” to give a more direct translation) instead of the bold slightly italic symbols that have become part of musical discourse. Other indications enter a gray (grey) area, such as dolce. While understood, it is not as firmly integrated into musical discourse. Other English alternatives such as sweetly, warmly, singingly, or even “in a warm and delicate manner”, convey slightly different sentiments whose nuances may be more appropriate to the musical situation. Then there comes the whole issue of tempo and the associated indication. For a newly composed work, I have never seen a composer get away with only giving an indication and not an actual tempo marking. I have seen performers, both amateur and professional, relentlessly grill composers about what metronome marking they had in mind, even when those composers’s work is firmly rooted in a tradition of trying to relive Mozart, Beethoven, or Brahms, who gave generic indications such as allegro. It seems to me, that because of their overuse in such a staggeringly array of different situations, indications such as allegro and adagio have become almost meaningless, especially when dealing with contemporary music. And lastly, these two issues of tempo indications and language come to a head in Mahler. Take for instance his fifth symphony (because it happens to be readily at hand). Mahler is a famous case for having score in a native language. In fact, Mahler has so much German in his score that Dover saw fit to publish a glossary of German terms and phrases at the beginning of the book. The tempo indication at the opening of the first movement is “In gemessenem Schritt. Streng. Wie ein Kondukt.”, which Google translates to “At a measured pace. Strictly. Like a funeral procession.” (not bad). Depending on one’s personal taste, this either falls perfectly on the line of just enough or too much. But the fact that it is in German conveys a more nuanced and personal message than just marcia funere. And then there is the famous Adagietto, the fourth movement of five. This is a fascinating case because Mahler chose what would classically be an Italian tempo indication as the title of the movement, and then wrote “Sehr Langsam” (“very slowly”) at the top of the page. Obviously the indication adagietto imparted a certain amount of information about the character of the music, but he found that an actual tempo indication was still necessary. Let me know what your thoughts are on this, or if I missed something big. Here is some of what I have been up to and what is about to start consuming my life. 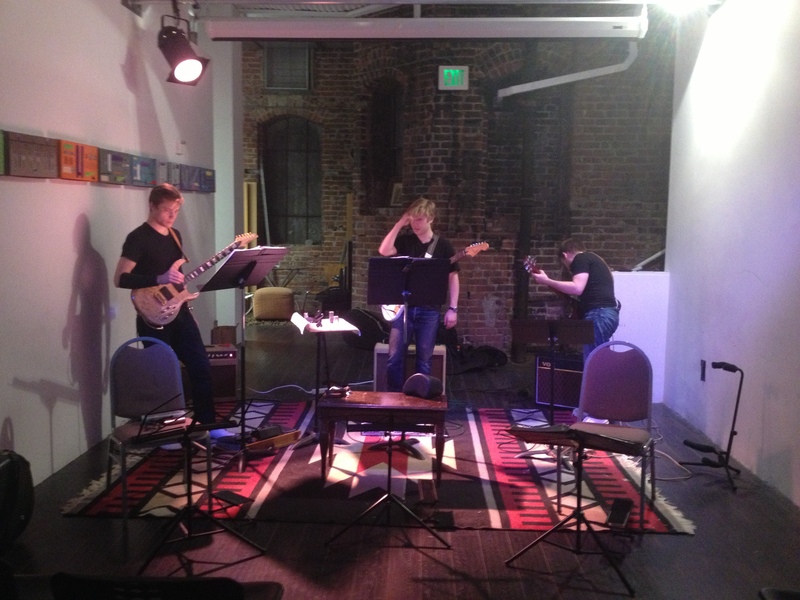 Last month I took part in a performance of Vexations over in Berkeley. You can check out the write up here. I just finished Waves for six guitars. This will hopefully be premiered at SFCM sometime next calendar year. It was partially inspired by Reuben Margolin‘s work. I am working on Piano Piece I, which will be the second piece in the series, following last year’s Piano Piece VI. Once PPI is finished, PPV will be underway. I am writing an oboe and bassoon duet for the wonderful Kris King and Sydne Sullivan entitled …on all sides of ours lives. We will be recording this on the 10th and premiering it on Sydne’s recital on the following day. Today I met with The Living Earth Show to start on the piece that I will be writing for them for the April 2, 2013 concert at SFCM, I watch the fire as the days echo away. I’m stoked to be working with awesome people and musicians on this project. New Keys just performed IV at their fall concert and did an awesome job with it. I will be writing a two piano eight hands piece for them for the spring. I am going to start work on a new orchestra piece, the emotional impetus behind which came from my work at the SFCM Archives. And lastly, I will be doing an installation at the Hot Air Festival this year which I am totally stoked about. I am excited to branch out from a strict concert setting for my work. It is an option that I have thought about exploring and I look forward to my first venture with it.